ACT365 delivers seamless integration between access control and video management accessible from anywhere, at any time and on any device. Quickly update or remove user permissions, view cameras or open a door from a PC, tablet or smartphone. ACT365 is a scalable cloud based solution designed to allow remote management of single or multiple locations, all from an easy-to-use interface. 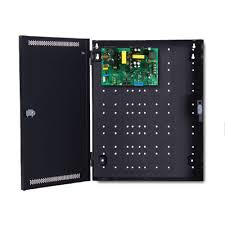 Each Access Control Unit (ACU) is a single door IP controller and connects to web based software hosted in Microsoft Azure. Video integration is available using the Video Control Unit (VCU) and supports up to (4) cameras per unit. 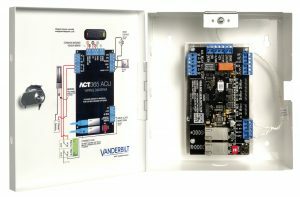 ACU Each Access Control Unit (ACU) is a single door IP controller (In/Out) and connects to web based software hosted in Microsoft Azure. System is scalable and supports unlimited controllers and cardholders. Supports 4 Inputs/2 Outputs, 32MB RAM and 10/100 Base-T Dual Port Ethernet Switch. Includes enclosure with LED power indicator, lock, tamper switch and battery backup. Power Requirements 12 VDC (sold separately). This 3 Amp dual voltage power supply includes battery charger and power supervision. On-board visual indicators allow for immediate installer feedback. Independent form C relay contacts are provided to report AC and system fault conditions to remote or auxiliary equipment. Power supplies come with two (2) 12VDC 7AH back up batteries. 3 Amps at 24VDC or 6 Amps at 12VDC selectable output. Recommended for use with bright/lite blue and ACT365 controllers. 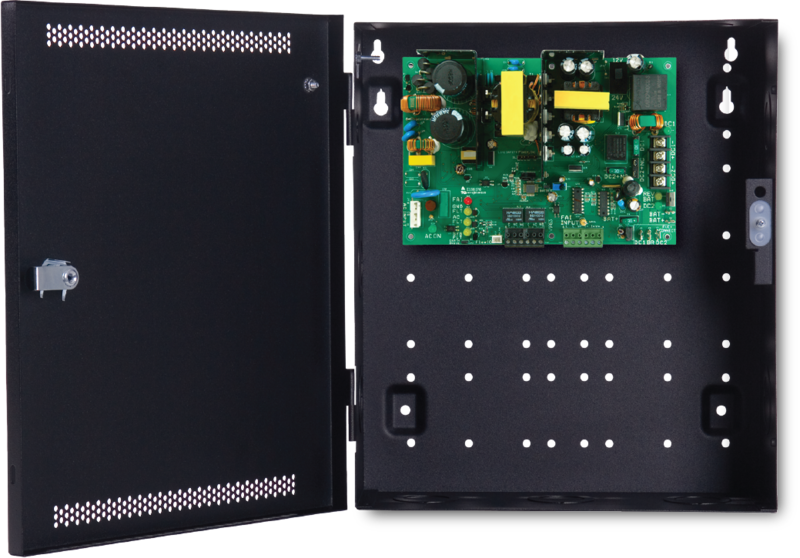 Our 6 Amp dual voltage power supply allows for flexibility in powering reader and lock hardware devices. Designed for excellent performance with readers, Vanderbilt power supplies are efficient, high performance switching power supplies with battery charger and power supervision. 6 Amps at 24VDC or 12 Amps at 12VDC selectable output. Recommended for use with bright/lite blue and ACT365 controllers. 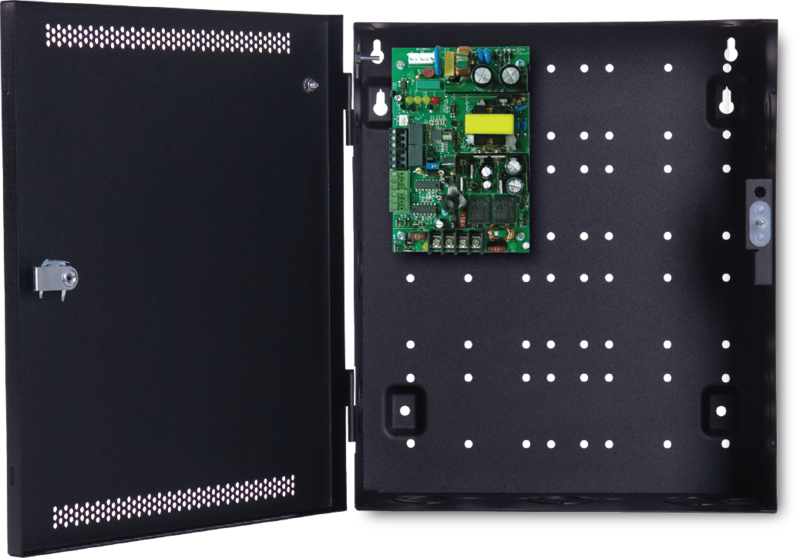 This dual voltage adjustable power supply affords the utmost in flexibility when it comes to system configuration. This power supply supports 10 Amps at 24VDC or 20 Amps at 12VDC. All Vanderbilt power supplies are efficient high performance switching power supplies with battery charger and power supervision. Recommended for use with bright/lite blue and ACT365 controllers. 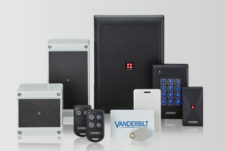 Vanderbilt’s access control systems support most industry standard readers and credentials, including magstripe, proximity and smart technologies. We offer a variety of choices when it comes to choosing your readers and credentials, including Vanderbilt, HID, Schlage and many others. Learn more about our Readers & Credentials product line here. Video integration is available using the ACT365 Video Control Unit (VCU) and supports up to (4) cameras and (1) TB of storage per unit. Scalable video solution integrates with ACU to produce access control and alarm reports accompanied by video.